Getting the C++ code of the dune-tectonic module as well as its dune dependencies and creating Linux1 executables from it. Instead of creating executables yourself, you can download pre-compiled ones for x86_64 Linux. Instead of running the executables yourself, you can download the HDF5 output they should generate. Instead of using the provided R scripts, you can download the files they would generated. The procedure outlined in the following paragraphs yields an Lzip-compressed2 tarball named dune-tectonic.tar.lz. It contains a 2D executable one-body-problem-2D and a 3D executable one-body-problem-3D as well as configuration files, copies of the dynamically linked libraries, and even a dynamic linker. By downloading such a tarball directly from here one can choose to skip this section. 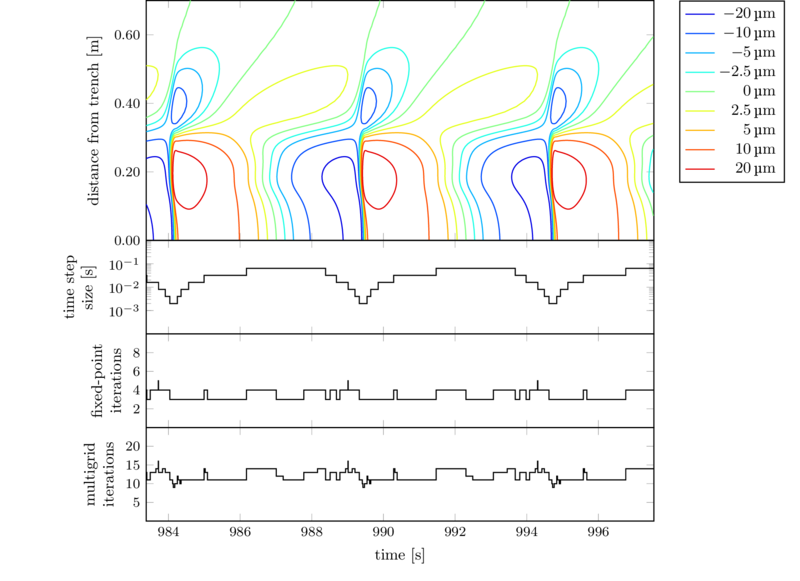 The numerical simulations whose results are presented in  are based on the 2016-PippingKornhuberRosenauOncken branch of the dune-tectonic C++ code. It depends on version 2.5 of a few dune modules (see also the dune.module file) which are available from the DUNE project and the FU Berlin (some from the former, some from the latter). The building procedure has been automated through docker. In the following, we will always assume that the variable tag has been set to 2016-PippingKornhuberRosenauOncken and that the git repository of Dockerfiles has been cloned in the following way. after which this entire section can be skipped. To be able to reproduce all the figures from , one needs to run twenty-one 2D computations and a single 3D computation. Each of the programs below can be passed the option -io.printProgress true in order to enable a progress indicator. Without this option, which is off by default, completing a time step will cause no output to be written to the console so that it may seem as if the program was stuck. where rfpitol should take the values 1e-7, 2e-7, 3e-7, 5e-7, 10e-7, 20e-7, 30e-7, 50e-7, 100e-7, 200e-7, 300e-7, 500e-7, 1000e-7, 2000e-7, 3000e-7, 5000e-7, 10000e-7, 20000e-7, 30000e-7, 50000e-7, 100000e-7. Dependening on the resources available to you, you might want to run all of the 2D simulations in parallel on a cluster (e.g. through slurm), in parallel on one or more multi-core machines (e.g. via GNU Parallel), but probably not in sequence (it would take weeks!). The number of available CPUs is the limiting factor here since none of the 2D simulations needs more than 100M of RAM. All but one of the 2D simulation plots (Figure 7) only put the data set 2d-lab-fpi-tolerance/rfpitol=100e-7 to use. If the reproduction of Figure 7 or the 3D simulation plots is not a priority, a lot of computing time can be saved by running just this one simulation. To be able to talk about seismic events or earthquakes and quantities related to them, we need to decide on criteria that allow a machine to determine the spatial and temporal extect of such an occurrence, and then apply these criteria. This task is carried out by a collection of R scripts which live alongside the LaTeX sources we will talk about in the next section. Once they are run, they populate a directory called generated with various CSV and contour files. By downloading the expected contents of this directory as a tarball from here one can choose to skip this section. The aforementioned R tools reside in the tools directory of the 2016-PippingKornhuberRosenauOncken-plots git repository. Before running them, the file config.ini needs to be edited such that simulation is set to the directory which contains 2d-lab-fpi-tolerance and 3d-lab from the previous section as immediate subdirectories. The boxplot from Figure 5 also requires a local copy of the file B_Scale-model-earthquake-data.zip from , whose location should be recorded in config.ini as the experiment directory. This entire process, too, is automated through a Dockerfile, so that one only needs to take the following steps to obtain the file generated.tar.lz. The LaTeX/pgfplots code that is used to produce the final figures is available from the 2016-PippingKornhuberRosenauOncken-plots git repository that also hosts the R tools from the previous section which we used to populate the directory called generated. We will now need the contents of this directory. assuming that ImageMagick is installed. The above steps should generate a series of PNG images which are shown here.